David A. Bader, Andrea Kappes, Henning Meyerhenke, Peter Sanders, Christian Schulz and Dorothea Wagner. Benchmarking for Graph Clustering and Partitioning. In Encyclopedia of Social Network Analysis and Mining, pages 73-82. Springer, 2014. David A. Bader, Henning Meyerhenke, Peter Sanders, Dorothea Wagner (eds. ): Graph Partitioning and Graph Clustering. 10th DIMACS Implementation Challenge Workshop. February 13-14, 2012. Georgia Institute of Technology, Atlanta, GA. Contemporary Mathematics 588. American Mathematical Society and Center for Discrete Mathematics and Theoretical Computer Science, 2013. The testbed for the Challenge comprises a large number of different graphs, both synthetic and real-world ones, coming from different applications. Please follow the individual links to reach their respective download pages with more information. The complete testbed, for example downloadable with the command wget -r -np http://www.cc.gatech.edu/dimacs10/archive/data/, has a size of roughly 20GB. We are still looking for more instances, in particular those based on real-world applications. If you can share your data, please contact us. Your contribution is very much appreciated! These graphs are synthetic graphs created with the Kronecker generator of the Graph500 benchmark. These graphs are synthetic meshes. They have been generated as part of dynamic mesh sequences which resemble adaptive 2D numerical simulations. These graphs have been generated as Delaunay triangulations of random points in the plane. These real-world social networks are created from co-authorships and citations. These graphs are real-world street networks. 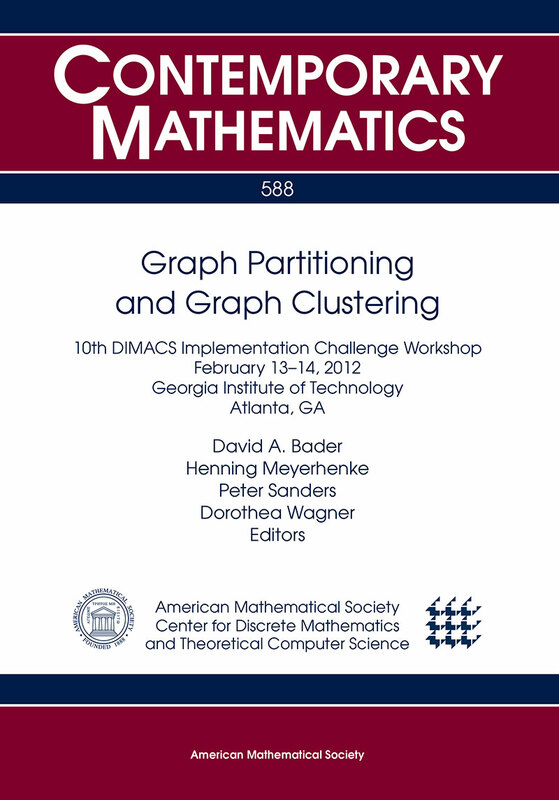 Chris Walshaw's graph partitioning archive contains 34 graphs that have been very popular as benchmarks for graph partitioning algorithms. The files can be downloaded from there or from our directory http://www.cc.gatech.edu/dimacs10/archive/data/walshaw/. Here we provide a small subset of the Florida Sparse Matrix Collection maintained by Tim Davis and Yifan Hu. These graphs have been generated from random points in the unit square. Edges connect vertices whose Euclidean distance is below 0.55 ln n/n. These real-world graphs are often used as benchmarks in the graph clustering and community detection communities. These graphs have been used in numerical simulations. Some random graphs from the G(n,p) model. A generator for computational task graphs of streaming applications is provided. Graphs representing the US states in the redistricting problem. Star-like structures of diﬀerent graphs with different types. Note that Tim Davis also included the current state (Apr 15, 2011) in the University of Florida Sparse Matrix Collection. At this site he also made his MATLAB® code available with which graphs can be imported to MATLAB from the Metis format. We use the popular Metis input/output formats for I/O (and extend them in certain cases). This applies to files for input graphs and solutions (partition/cluster assignments). All files are simple ASCII text files. In the following descriptions, n denotes the number of vertices in the graph. Note that for the Challenge the input graphs might be seen as unweighted, i. e. weighted instances might be seen as having unit weights for both vertices and edges. Details on this aspect will be announced later. Following the Metis User's Guide, Version 4.0, the graph files may contain comment lines that begin with the character '%'. Such lines are ignored. At its simplest a correct input contains n+1 uncommented lines. The first of these lines contains either two, three, or four integers, separated by space. The first two obligatory entries are the number of vertices and the number of edges in the graph. Note that in this case the number of edges is only half of the sum of the vertex degrees. The third and fourth parameter in the first line are optional and control input of weighted graphs. For details on weighted graphs see Section 4.5.1 of the Metis User Guide, Version 4.0. Important: There is one exception to the use of the format described in Section 4.5.1. If the graph contains self-loops and/or multiple edges, the third parameter in the first line is set to 100. Since Metis does not allow such graphs, this extension of the format is necessary. To exclude these graphs upfront would mean to exclude many real-world instances. Also note that in this case the second parameter is the actual number of edge entries in the file, i. e., the sum of the vertex degrees. This deviation is necessary due to self-loops. They do not appear twice in the file, as undirected (= bidirected) edges do. In the unweighted case, the remaining n lines contain neighbor lists for each vertex from 1 to n in order. These lists are sets of integers separated by spaces and contain all the neighbors of a given vertex. The neighbors may be listed in any order. Note that vertices are numbered 1 to n, not from 0 to n-1. For possible extensions, please refer again to Section 4.5.1 in the Metis User Guide, Version 4.0. You will find there examples of small graphs and their respective representations, too. The partition/cluster assignment files have n uncommented lines. In line i the assignment value for vertex i is given as an integer between 0 and p-1, where p is the number of partitions. Vertex coordinates can optionally be supplied in a separate file. This file should have the same name as the graph file. But instead of the file extension .graph, the coordinate file has the extension .xyz. These coordinate files must have n uncommented lines, with line i containing the coordinates of vertex i. Each line must contain one, two, or three floating-point values, depending on the geometry type. Jan 23, 2015: A new paper has been published in the Encyclopedia of Social Network Analysis and Mining. Feb 18, 2013: The Challenge book will be published by AMS soon. Mar 31, 2012: The challenge results are online. Mar 30, 2012: Archive update: New graph category Star Mixtures. Feb 24, 2012: Most talk slides are available. Feb 10, 2012: Final workshop program online! Jan 23, 2012: The challenge instances have been announced. Happy computing! Dec 27, 2011: Tim Mattson (Intel) has joined the advisory board. Welcome, Tim! Dec 1 and 12, 2011: Updated workshop registration information, new graphs in category numerical! Nov 7, 2011: Thank you for your submissions! New details on workshop times available! Sep 21, 2011: Updated workshop and venue information. Sep 12, 2011: Archive update: New graph category Redistricting. Jul 26, 2011: Archive update: New graph category Erdös-Rényi, additions to category Clustering (see the description page for details). The new archive size is about 35GB. Jul 7, 2011: Minor update of objective functions to handle some pathological cases. Jun 28, 2011: The call for papers is online. Apr 15, 2011: The scoring rules and objective functions are now available! Apr 1, 2011: Maintenance in the testbed archive nearly completed. Some additions and descriptions are still expected. Changes of and additions to the testbed data from this point on will be announced on the mailing list. Mar 14, 2011: A few changes in the directory structure and file names have been made to improve consistency. All testbed files (approx. 20GB) are now downloadable with wget -r -np http://www.cc.gatech.edu/dimacs10/archive/data/. Note that the webserver creates a few additional HTML files (mostly directory listings). Feb 1, 2011: Official Challenge launch! Jan 7, 2011: The website is published at its permanent location. Website created and maintained by Henning Meyerhenke. Design based on the template Deviation by Free CSS Templates.